Can you choose between these two fan favourites? 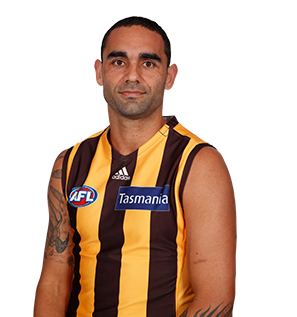 Shaun Burgoyne is set to equal the second most games played by an indigenous player. 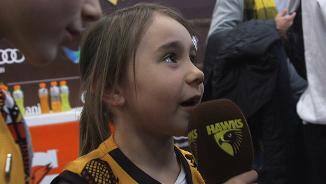 Which Hawk was awarded the perfect 10 for his performance against the Crows? A bittersweet year for the AFL’s oldest player. 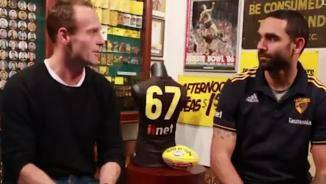 Celebrated his 350th AFL game and his 200th for the Hawks, but his consecutive streak of 107 games was snapped by a hamstring strain in round two that kept him out for three weeks, while another strain sidelined him for four games later in the season. He had a quiet finals series, but it later emerged he played through September with broken ribs. 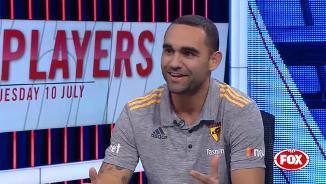 Nevertheless there was no hesitation giving Burgoyne another 12-month contract because he recovered so well from the injuries and he can plug a hole in defence, sneak forward for a goal and win a key clearance through the middle. Averaging 18.6 touches and 4.2 tackles a game, he more than earns his keep. Player honours: Port Adelaide 2nd best and fairest 2006; Hawthorn 3rd best and fairest 2016; All-Australian 2006; All-Australian nominee 2014, 2015; International Rules Series 2008, 2017 (captain); NAB AFL Rising Star nominee 2002; Port Adelaide premiership side 2004; Hawthorn premiership sides 2013, 2014, 2015; Port Adelaide pre-season premiership side 2002. Brownlow Medal: career votes 83. Previous AFL club: Port Adelaide (2002-09: 157 games, 171 goals). Draft history: 2000 National AFL Draft 1st round selection (Port Adelaide) No. 12 overall on-traded by Hawthorn to Adelaide for Matthew Bode and No. 48 (Matthew Smith); 2009 NAB AFL Draft traded by Port Adelaide for No. 9 (Andrew Moore) and No. 16 (Jasper Pittard).